A Crying Shame – Street Kids Robbed Of Home | HURAH! 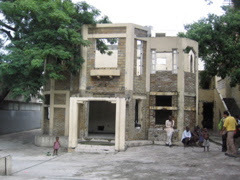 This gutted building once housed a few hundred kids rescued from the streets of Port-Au-Prince by Fr. Jean Bertrand Aristide in the 90s and into the new century. It was called, Lafanmi Selavi (Family Is Life). The fate of kids driven to the streets by poverty, abuse, or death back in the Duvalier dictatorship days was not only street violence, but, not unusually, extermination by paramilitaries. “Cleansing” the population was the way these utterly depraved men described what they were accomplishing. Fr. Aristide signaled the end of such treatment if he could have any say in the matter. A crying shame. That human beings, let alone young children, could ever be treated this way is not the only shame. Almost as soon as the doors were opened back in the 90s, enemies of Aristide’s social programs began plotting to keep this home from becoming a beacon of hope for the poor. It was attacked and damaged. Outsiders plotted with some residents to overthrow the home and denounce it as a bad place for kids. Subsequently these same kids confessed to the ruse. Finally in Feb. of 2004 the place was closed for good. Then President Aristide was kidnapped by the US government in a ruse to protect him from a “popular uprising”. In fact it was a small band of mercenaries who went on a rampage with powerful CIA-derived weapons in the north, killing innocent people. Lafanmi Selavi, the home for street kids, already virtually closed, was further ransacked after Feb. 29, staff beaten, and left abandoned. 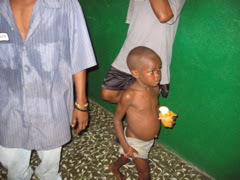 One of the residents of Lafanmi Selavi was Reagan Lolo who was driven to the streets by family violence at age 11, but was soon rescued by the Aristide staff. He prospered there and became nationally known for his news commentary and disc jockey work at the Aristide Foundation’s Youth Radio and TV station. When the last coup brought down Pres. 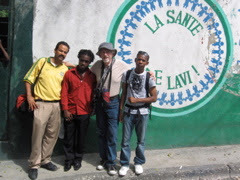 Aristide in 04 and thugs began attacking the home, Lolo, now living with friends and finishing high school, went to its rescue, put street kids back in, recruited adult volunteer caretakers, and put up barricades. After a few weeks the police arrested Lolo without any warrant and clamped him in prison where he languished for over 3 months in jammed cells, eating infested food and drinking contaminated water. An honest judge threw his case out but to no avail. The justice department under the control of the illegal interim government of Gerard Latortue (a US supported measure) did not respect such orders regarding anyone connected with Pres. Aristide. On June 25, 2004 through the dogged efforts of Atty. 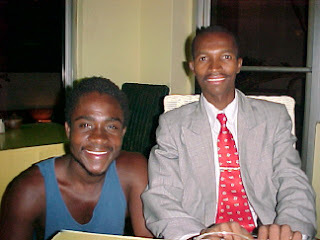 Evel Fanfan, President of AUMOHD a Haitian human rights, non-violent/non-partisan, advocacy group, Lolo was freed from prison, a first for the partnership of Hurah, Inc and AUMOHD. Now Lolo is continuing to work on his dream of working for street kids by laying a solid foundation for the revival of Lafanmi Selavi. He has been elected among his peers from the former residents as coordinator of the team to bring Lafanmi Selavi back to life. Lolo has already formed a community organizing project. Here is a new kid, amazingly young, hanging out at the old Lafanmi Selavi and part of a group of 20 invited by Lolo and his committee to consider forming a “family” in his old home. There are substantial parts of the building left where a classroom, a storage room and living quarters are slated to be made permanent. Beside the structural difficulties that need to be rectified there are the problems of ownership, and vagrants who consider this their territory. But Lolo and his committee are working carefully with the authorities and with AUMOHD to get this groundwork taken care of as they look for funding. Here Paul, a volunteer, Lolo, Tom Luce, and Patrick a former resident and member of the steering committee stand out front of the home. The sign was for the now closed women’s health clinic that came in after the home was ransacked.